If you’re a freelance writer, do you have a website for your services? If you do, are you attracting clients with it or is your site sitting there, unable to convince anyone who shows up, why they should hire you? 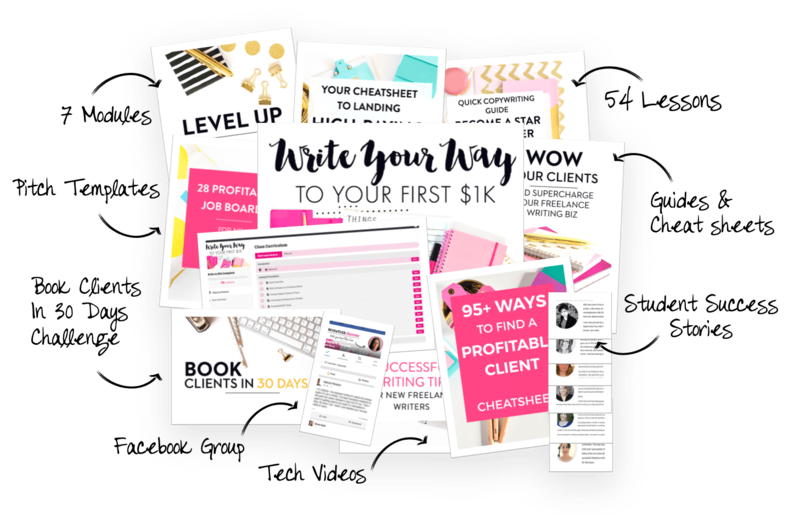 Maybe you have a blog already with a Hire Me page, hoping to land your ideal client. 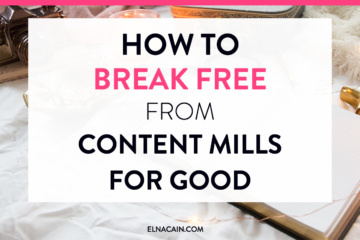 If this sounds like you and you’re struggling to reach those high-paying clients, maybe this is the year to focus on creating an optimized writer website and brand. My writer website has gone through a few changes in only a short period of time. It seems as a new year approaches, I get the itch to tweak my site, change things around and breathe new life into my brand. And this year is no different. I changed my logo, color, home page and parts of my copy. I mostly focused on attracting my ideal client – digital marketing businesses or entrepreneurs. And it’s working. I’ve already landed three digital marketing clients with this new focus. 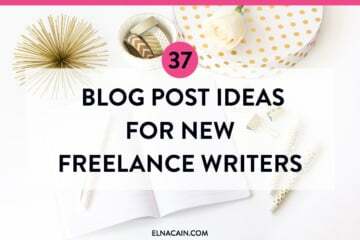 So, how did I go from newbie freelance writer with several niches and hardly any samples to now having prospects regularly contact me for digital marketing content? Let’s look at how my writer website evolved. I have a headshot – this creates a level of trust for new prospects who go to my site. I explain who I want to write for – my first question asks small businesses if they need valuable content for their blog. 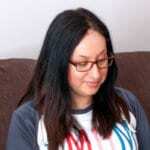 I introduce myself and make it known how I can help small businesses if they hire me – a prospect can quickly tell that I’m a freelance writer who writes articles or blog posts and who can help them increase their online visibility of their site. I had this website for only a few months before I changed it, and it helped me land clients, but they weren’t my ideal clients. I didn’t care at the time since it was paid work, right? I had no call-to-action above the fold – this screenshot is of what you would see above the fold (before you scrolled) and there is no button or link to contact me. This could have lost me some potential business. People are busy and they want to know right away who you are and how to contact you. My headline is weak – my headline, Quality Content from an Innovative Writer, doesn’t speak much of anything. I mean I’m sure my next door neighbor can make this claim. It’s pretty generic and broad. This, again, doesn’t speak directly to my ideal client. Businesses and entrepreneurs want more than just quality content; they want a writer who can help them grow their business. My lead magnet doesn’t speak to my potential client – I created a lead magnet to grow my email list, but I wanted to attract freelance writers, not really businesses since my blog focused on writers. But, if you are a prospect who landed on my site and saw that, they may be confused about what my true message is. My copy is weak – I don’t clearly define what I do and how I can really help a business. Really, it doesn’t show my unique selling point. This is what makes me stand out from other writers. In this copy, I just say I provide engaging and quality content – any writer can provide this. So, I knew once the New Year hit, I wanted to change my site and tweak it for better conversions. 2015 was the first full year I was a freelance writer. I grew a lot during this time, both in my business and in my confidence. I wanted my writer website to reflect more of my unique selling point, which is adding color to your content. And I was able to land more clients closer to my ideal client. If you noticed, I made a new logo, added a call-to-action above the fold, introduced myself and told prospects what exactly I do. And my headline and body speaks to what I provide if you hire me. I also added a “where I’m writing” section, which I was excited to do once I had guest posts and client pieces to promote. Throughout the year I have added new logos to highlight the best clients and guest post pieces. Overall, I love this site. It speaks exactly what I wanted to reveal to prospects. But, towards the latter half of the year, I really started honing in on the digital marketing niche and this site just wasn’t cutting it. This is my updated site for 2016. It’s the same look today. This site is highly optimized to speak to a digital marketing business or entrepreneur. With a new logo, color and headshot, I changed my copy to attract my ideal client. I also added some high authority sites I’m writing for. I worked on changing my homepage copy to let prospects know the value I have as a writer and what I can do for their business. The new site isn’t 100% done, but I’m happy with it. I’m also excited to see how this will convert in the long-term, but I suspect from the recent inquiries for my digital marketing content, that I’m attracting my ideal client now. So, how do you know if your website isn’t attracting clients (besides the fact no one’s contacting you)? One of my coaching clients, Elise, has been a writer for years, but really wanted to ramp it up for 2016. I took a look at her website (this is a screenshot of her entire homepage). Now, on first impression, it’s quite nice! She has her headshot on the front page, what she likes to write about, and a headline to pique your interest: There’s enough junk out there already. The rest of her pages were great – her About page wasn’t all about her, she had strong testimonials and a full portfolio. But, as I read her copy, I quickly saw the problem – she wasn’t speaking to the client. 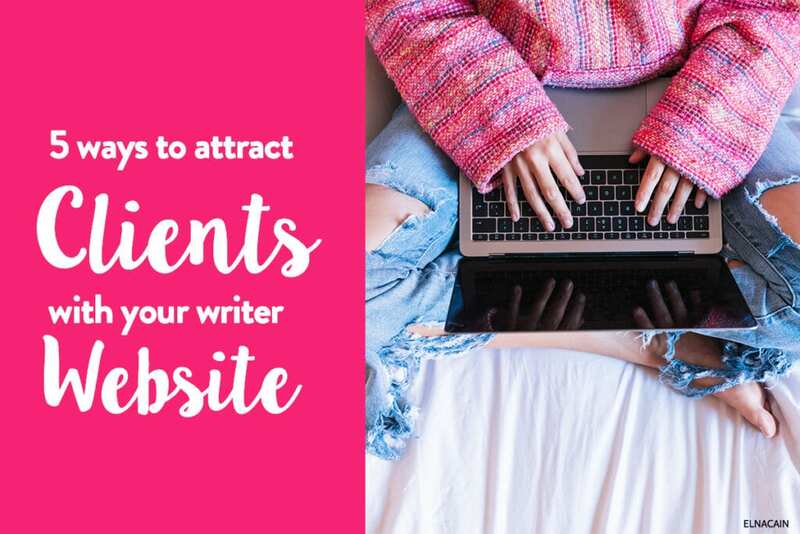 Your writer website should speak to your ideal client. What if you don’t know your ideal client? That’s okay! Take some time today and think about who you want to write for. Is it big brands? Small businesses? Publications? Universities? The hotel industry? Influencers? Authors? The list could go on. Once you narrow down the who, next is the what. So, what will you write about? This is also known as your niche. If you don’t have a niche, you will have a hard time taking your freelance writing business to the next level and attracting high-paying clients. If you don’t have a niche, start thinking about what you want to get paid to write about. 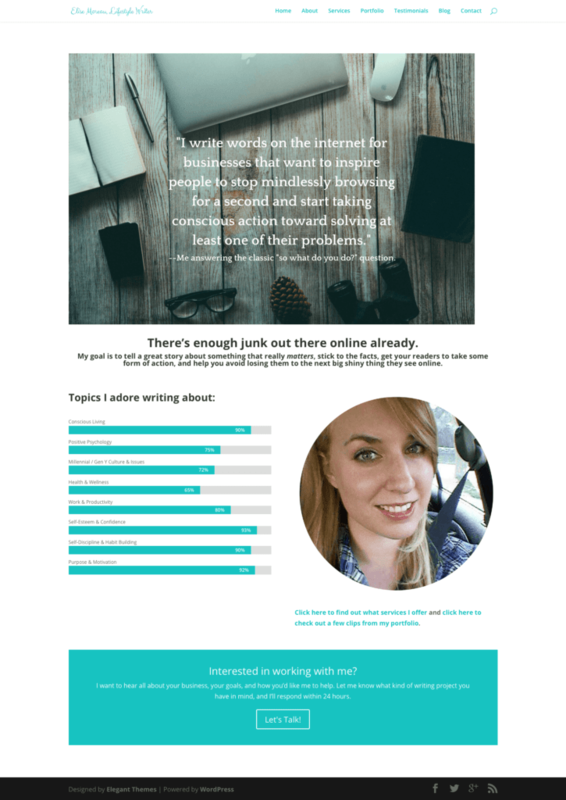 (notice these topics aren’t that popular in the I want to get paid to write category). She also calls herself a lifestyle writer. But that’s it. I don’t know if she writes only blog content, articles or anything else. So, when looking at your home page, do you make it clear what niche you write in? Make it easy for a prospect to contact you. Have a call-to-action button, social media profiles, Skype ID, phone number and any other ways to contact you easily accessible. Have this information throughout your website too. While researching this writer’s portfolio I learned she is a writer for About.com. But, looking at her site, it was nearly impossible to know this. About.com is a huge authoritative site to be writing for and she could’ve leveraged this platform to help her attract high-paying clients…but she wasn’t. Where I am writing later in 2015. While these aren’t all the places I’ve written for, I wanted to highlight certain businesses and guest post spots. If you landed some guest posts and paid gigs, be proud of it and promote it on your site! One new thing I added to my home page were some testimonials. I feel having social proof can really help your credibility as a legit writer. While I always did have testimonials on my site, I never put them in my home page. It’s a good idea to have some social proof on your home page; this can tip the scales in your favor if a prospect is on the fence about hiring you. 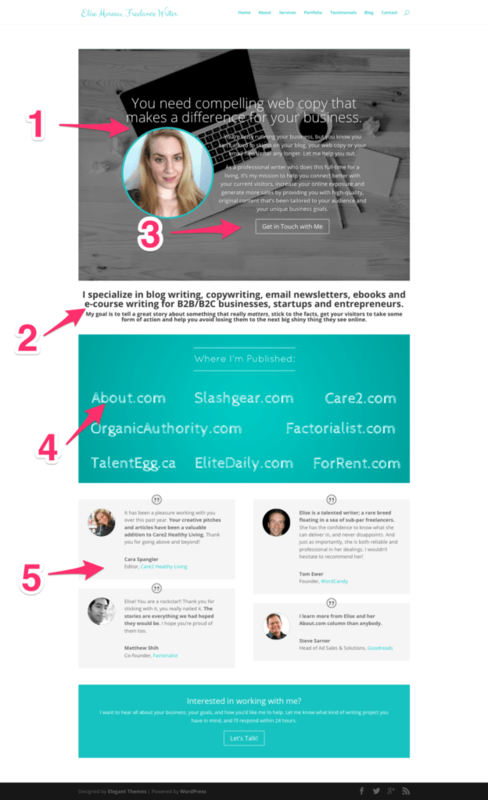 Okay, so want to see how my coaching client updated her site for better conversions? After our coaching call, she worked on her writer website and now it’s totally speaking to clients! Your advice really helped – the CEO of a startup contacted me through my site last week about a project and now we’re talking. Crazy how a few good tweaks can really make a huge difference. While it isn’t necessary to have a writer website in the beginning, it is vital to your business growth as a writer. In the beginning you can get away with using Contently or LinkedIn for your portfolio, but in the long run, clients seek professionalism and having your own writer website looks professional. And if you really focus on your copy to speak to the client, make it easy to contact you, explain your niche and have social proof in a simple design, you can have a site that converts. Over to you – what are you going to do to optimize your writer website? I’m so glad you spoke about writing for your audience – I feel like sometimes people don’t want to write copy that sounds “salesy”, but you end up writing meaningless fluff if you don’t write to market yourself! Thanks so much. I would put a picture above the fold. I would actually make it the first thing people see when going to your website. It’s inviting! I need to go back through the copy on my website and your post has given me the motivation to do so. I’m in the middle of changing niches again as an experiment. I’m disappointed in the niche-change since I love my original niche but it’s for the better, I’m sure. Thank you for the kick in the rear end, Elna! Attracting customers is difficult for any web design business regardless of how well-established it may be. thanks for sharing. You’re write. Actually, any service-based business online has to have a strong marketing strategy to get noticed! Thanks for stopping by! You’re welcome so much. So happy you found some great tops to get your website up and going! Hi Elna, Your post is the best gift for me to change my life. I was disappointed consecutively apply in century jobs in different job marketplaces and not getting jobs from clients. After reading your post i am so confidential. Now i can say loudly “Yes, i will get jobs”. Thanks a lot for sharing your informative post ! Thanks for letting me know this and yes you can get clients via your website so good luck! Really enjoyed this post (second time reading it, I’m in a website update mood today!) and I wanted to ask – what’s your new website theme and what is the font you used for your updated logo? Love your posts. Thank you for always sharing actionable, practical advice! My theme is customized for me! Sorry (but I’m in the works of setting up a writer website service!). As for the logo, I think it’s Prerella. No worries 🙂 had a feeling but thought I would still ask! Oh my God! I have gotta change my home page and About Us page! With all the fancy content, we forgot to speak directly to clients! I think its high time we should! Thank you so much for these amazing insights! Glad you enjoyed my post and it got you to take some action for your website. Can’t wait to see it. Great post! It’s amazing how much more compelling a targeted pitch to a specific niche is than a general outline of your writing skills. I especially love the testimonials, the research shows that with increasing access to the internet, people shop around more than they ever did before and social proof from other happy customers is becoming more and more critical! You are right; social proof is a compelling thing to have on your site. That’s why I added them to my home page. I’m hoping this will improve my conversions. Great tips Elna. I’m doing some tweaking to my web design site so the tips you shared here will be helpful because now I know what I need to make a great site to attract clients. It’s great to see how you’ve evolved as a freelance writer, congratulations on your success and I wish you much more! Thanks! Loving your new website and looking forward to your new modifications! It can take a bit of time to figure out what your want your website to really say to a potential client, so don’t rush it and take your time! Thanks Elna – another great post! I love how you give concrete, illustrative examples with useful, actionable advice in all your posts. I love reading posts with visual examples too! They seem to help you learn the material better 🙂 And since I love graphics, I use them liberally on my blog. Thanks for stopping by! I can’t wait to see your new site! 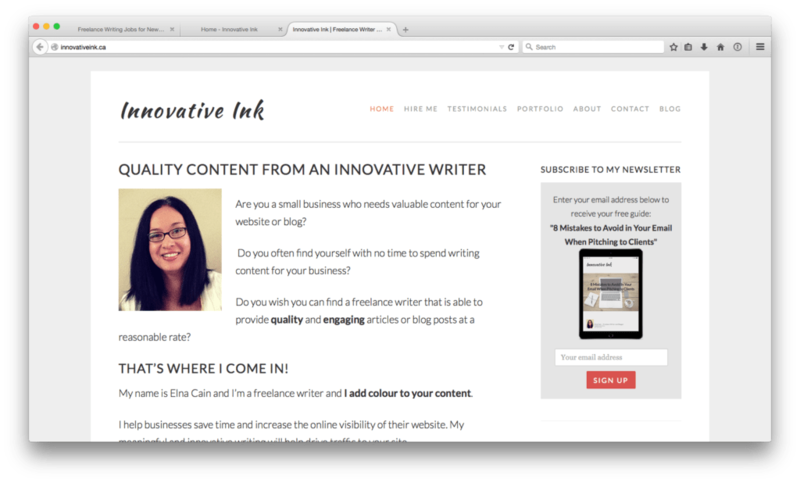 So excited for you that you will now have a writer website for your biz! Its a great post I guess I would have to revamp my service website I would include all the tips you did mention and see how it goes. Mean while I would be happy if you could have a look at my freelance website and kindly advice one or points that I can improve upon. Thanks so much! That’s great you found some tips to help optimize your writer website. I’m pretty swamped at the moment, but when I have free time I’ll be sure to take a look at your site! 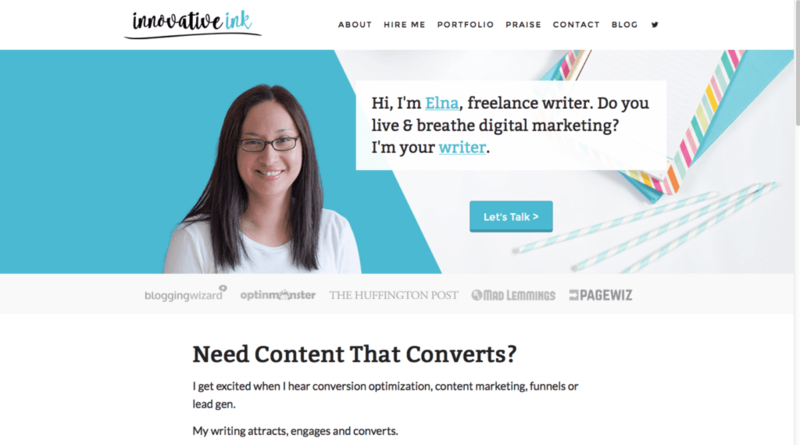 I totally love what you’ve done with your writer’s website, Elna! I’m guilty of tweaking my site periodically, as time permits. That’s okay! 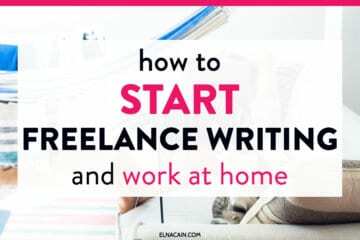 When us freelance writers have time, which isn’t very often, then we can really sit down and see how we can make better websites. Great post, Elna. I LOVE the example you showed. Her new site really shows off her authority now whereas it looked pretty generic to begin with. Your site has always been an inspiration for all my sites 🙂 So, you know I LOVE whatever you do on your site. Great job! I entered the freelance writing world two months ago, and I still have no writer website. I think it’s about time I review that to increase my chances. Chances meet the prepared mind. And you see how important it is to link to our old blog posts: I’ve bookmarked “The #1 Quickest Way to Make Money As a Blogger” to work on some great ideas in there. Like I mentioned, it’s not required when you first start to have a writer website. A writer in my Writeto1k course doesn’t have a writer website. She has a Contently profile for her portfolio and a LinkedIn profile. She’s landing clients left and right and now feels this is a good time to start her writer website (since she’s drumming up business). Go at your own pace! Thanks again for bookmarking my posts! I love looking at the evolution of your writer website over the years. The animated job descriptions in your header in the 2016 edition is super slick, too. Yes, in the early days, we all start with what’s free and simple, don’t we? Sometimes we need to find our niche and voice before we can really put together a great portfolio website. I like that you’ve done such a good job at identifying who you target client is. When you’ve established that much, it makes writing copy a lot easier, doesn’t it? Anyway, I’ll share out this post. Have a good one! Thanks! Yes I love the animation. Such a neat element to a site that’s a bit unexpected, but it does make you pay attention. Yes, it does make sense to bootstrap your business as much as possible. If that means free hosting or a free theme, go with it. But, sooner or later you need to invest in your business if you really want to see an impact. I have such a clearer understanding now of what really makes a good writer website. Instead of focusing primarily on what the client was looking for, I fell into a pretty bad habit of getting caught in nice looking designs and talking too much about what I wanted. My About page is the next area I’m going to work on tweaking a bit more so it really speaks to the client. I totally love the animation of your intro in the wide image on your new site BTW, is that a plugin or is it part of your theme? 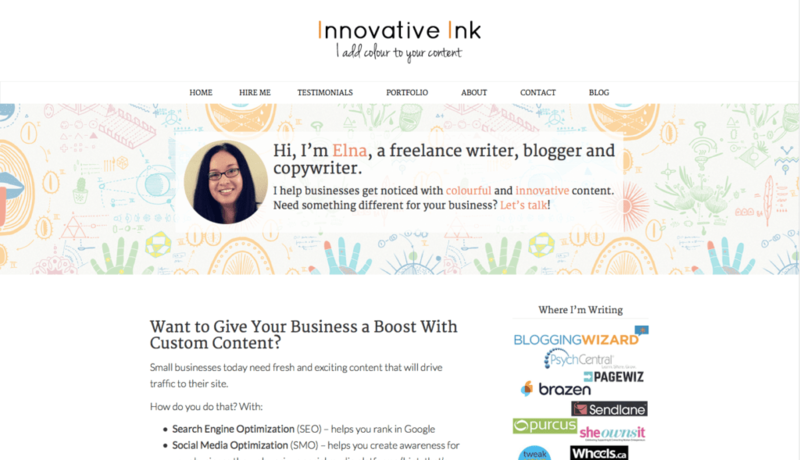 Having an optimized writer website to attract clients is what will take you to the next level! Your new site is amazing! I absolutely love it and that’s why I wanted to feature you in my post. Thanks for the compliment on my site! My husband developed it and he used a java script plugin. Here’s more info on it https://github.com/mattboldt/typed.js but not sure if there’s a WP plugin for that.